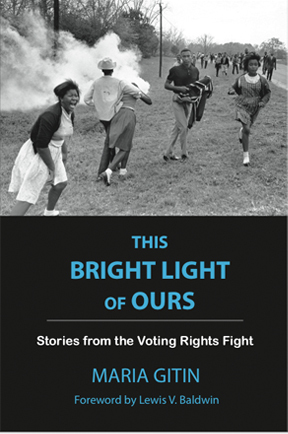 Maria Gitin is available to read from This Bright Light of Ours and to discuss her experience as a teenage civil rights worker in rural Alabama in 1965. Maria Gitin presents to college and university students, to community groups, nonprofit organizations, and at Martin Luther King Jr Celebrations. She is also available to develop interactive racial justice training and offers coaching to faculty teaching civil rights history. Presentations include personal stories and photos of her and her African American co-workers during the Civil Rights Movement along with discussion of current voting rights and social justice issues. In order to tailor her presentation to meet your needs, please tell us more about your plans. Maria Gitin is a professional speaker, please prepare a budget for travel and honoraria. Which of our options are you considering? What is the size and demographic profile of the audience? What is the event's anticipated budget?